Content managers, we meet you halfway. ImpressPages is designed for people to create beautiful websites with quality content. 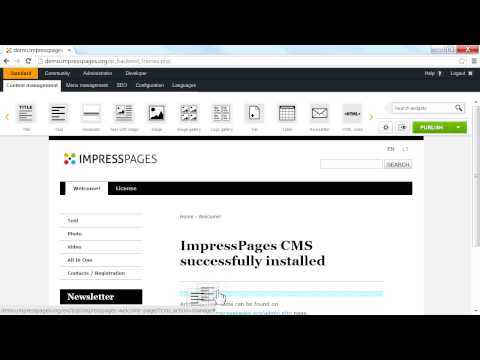 Create websites with good content ImpressPages is a modern high-quality tool for website development and management. From the point of quickly and easily building a new website, to administering it with no hassle. ImpressPages raised capital from venture capital fund Practica Seed Capital KB using the structural support for the 2007-2013 economic growth program, co-financed by the European Regional Development Fund (ERDF). A new MVC engine based on globally recognized PHP components is under the hood so you can customize ImpressPages in no time. Write your own plugins and themes to suit your and customers’ needs. Both website layout and administration interface are user-friendly and simply gorgeous. Hundreds of beautiful corporate and personal websites run on ImpressPages and one would never tell they have a common CMS. Website management made easy with true inline editing and drag&drop interface. Edit pages as you see them, not from somewhere under the hood. Drag and drop pictures, videos, polls, menus, whatever you like. Copy&paste and they will always match your current styles. We want to give back by providing a support that’s always accurate and on time. Access detailed user guides and tutorials online; engage our vibrant community and get help from individuals just like you. Function can be beautiful. That’s why we’ve built a Marketplace full of funky themes and plugins to make your content engaging and good looking. Find what’s best for you and your client. Submit yours to earn cash and even get fifteen minutes of fame.